Beyond Genealogy: Do you have GILBERT, OSWALD or POTTER in Your Family Tree? Do you have GILBERT, OSWALD or POTTER in Your Family Tree? 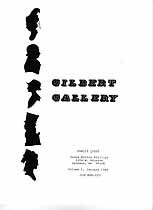 If so, and if you hadn't already subscribed to these family newsletters back in the 1980's, you will want to read the Gilbert Gallery, Oswald Outlines and Potter Profiles issues for free at Genealogy Today. Donna Potter Phillips produced these newsletters, and asked me to digitize and host the issues on my web site so that genealogists could access them. It took some time, allowing for the original paper copies to travel cross-country, get scanned and then posted online, but all three publications are now completed and available for download. These newsletters are filled with interesting articles, subscriber queries, photographs and loads of information about the families -- Donna refers to this as the "good stuff." If you have materials produced in the pre-Internet age, and would like to share them with online genealogists, I'd be glad to digitize and host them for you at no charge. Contact me for instructions as to where to ship the materials.